School is out for the summer, but come August, many school foodservice faculty members are preparing meal plans and confirming operations for the fall. Two of the industry’s biggest national conferences occur in July, the School Nutrition Association (SNA) and the National Association of College & University Food Service (NACUFS), drawing large crowds of vendors looking to sell products designed for the school systems. 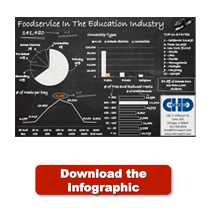 In celebration of foodservice in the education industry, CHD Expert, a leading foodservice data and analytics firm, has released new figures that evaluate the foodservice landscape of both public and private schools across the United States, covering data from Kindergarten to 12th grade (K-12) as well as Colleges and Universities (C & U). To view a visualization of the education industry in the United States, please download this complementary infographic. In the CHD Expert database there are approximately 109,000 K-12 schools, 4,800 universities, and over 13,000 school districts through the United States. The primary school segment accounts for approximately 83 percent (or 91,404) of total K-12 market, leaving the secondary school segment with the remaining 17 percent. The CHD Expert database defines Primary Schools as institutions that teach children from Kindergarten – 6th grade, and Secondary Schools as institutions that teach children from 7th-12th grade. Considering ownership, 77 percent (or roughly 70,392) of primary schools are public or government operated, while 15 percent are private, and 7 percent are categorized as religious. Of the approximate 18,273 CHD Expert-documented secondary schools, 92 percent (or 16,758) are public. Such data highlights public primary schools as a major potential market for school foodservice providers. For complete breakdown please see Figure 1. Primary schools are the most prevalent school type in the USA, accounting for approximately 72 percent of total K-12 enrollment. As of July2014, CHD Experts data confirms there are approximately 91,000 primary schools throughout the USA. Almost 87,000 of these schools have enrolments that are less than 1,000 children. Among secondary schools, there are approximately 18,000 across the nation. There are about 12,300 of them with less than 1,000 students enrolled. Secondary schools tend to be larger, with multiple primary schools feeding into large High Schools. According to the CHD Expert database, secondary schools do outnumber primary schools, when considering schools with more than 1,000 students enrolled. Public schools dominate the primary and secondary schools landscape, accounting for approximately 75.5 percent of all K-12 institutions. See figure 2. When selecting food products for their schools, staff use specific criteria to choose vendors, and the vendors themselves use their own factors and variables to guide them to the schools they want to sell into. It truly is a fine balance. There are different requirements and strategies needed to sell to a public versus a private school, and a manufacturer or distributor needs to approach each opportunity accordingly. Another important element (besides type and ownership of the school) for foodservice professionals to consider is the Free and Reduced Lunches program. According to the USDA, as of 2012, there were 31 million children participating in the National School Lunch Program. Understanding the concentration of the federal-assisted meal program for each K-12 school and district enables foodservice providers to better direct their sales efforts and shape their marketing strategy. According to CHD Expert’s data, there are approximately 4,400 school districts in the U.S. that have more than 500 students on the Free and Reduced Lunch program. See Figure 3. CHD Expert’s data on school districts also indicates that the three states that provide the most Free and Reduced Lunches as a percentage of total lunches served are Texas at 8 percent, California at 6.8 percent, and Illinois at 6.1 percent. More broadly speaking, the Midwest Territory has the largest percentage of school districts with Free and Reduced Lunches at 39.5 percent, followed by the North East Territories at 22 percent and South Central Territories at 15.2 percent. Foodservice professionals looking for a target – rich environment in the education market should look to the essential metric of meals served per day. According to CHD Expert’s data, approximately 41.8% of the school districts in the country serve over 2,000 meals per day. CHD Expert has also evaluated the Colleges and Universities foodservice landscape. According to the CHD Expert database, of the roughly 5,100 universities in the USA, 49% are four-year institutions, 32% are two-year institutions and 13% being technical and trade schools. Interestingly, there are more private 4-year universities than public, and a high percentage of religious technical and trade schools. See Figure 4. The meal breakdown among Colleges and Universities is led by 4-year institutions. Large Universities and big college campuses are a desired destination by many high school students who are trying to take their next steps in life. These large undergraduate populations require a lot of food, and in some cases, this leads to the dreaded Freshman 15, the 15 pounds a first year college student typically gains living near campus or in a dorm. Figure 5 breaks down C&U Meals Per Day. Understanding these key points, for instance where the bulk of meals are going, will certainly help foodservice providers make valuable strategy decisions within this potentially lucrative market.